After some uncertainty about the winds, the Solar Impulse team has taken off from Hawaii, venturing off on another leg of their solar-powered, around-the-world journey nearly 10 months after landing in the state. The aircraft landed in Hawaii last July but was forced to stay in the islands after the plane's battery system sustained heat damage on its trip from Japan. 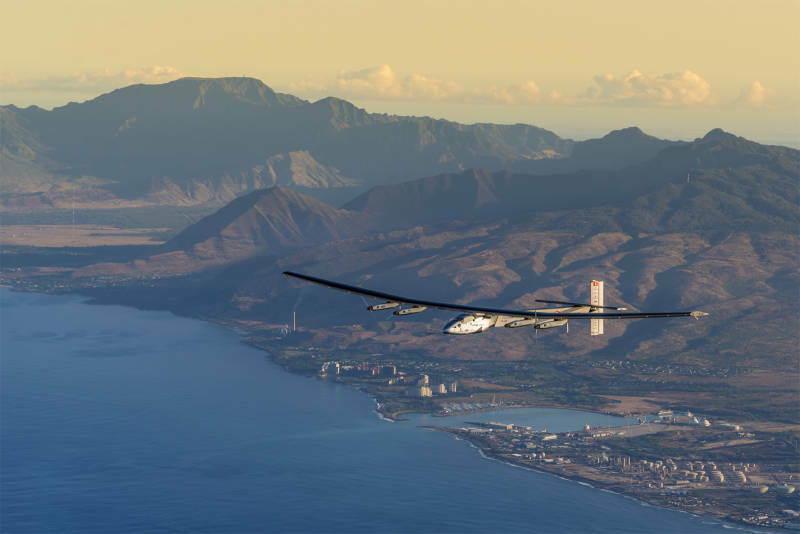 The Swiss-made Solar Impulse 2 left Hawaii early Thursday and was on course to land in Mountain View, California, in about three days. The aircraft started its journey in March 2015 from Abu Dhabi, the capital of the United Arab Emirates, then made stops in Oman, Myanmar, China and Japan. It's on the ninth leg of its circumnavigation. Piccard said the idea of crossing the ocean in a solar-powered plane a few years ago stressed him out, but Thursday morning he was confident things would go according to plan. Piccard also said the flight's destination, in the heart of Silicon Valley, is fitting. He said on his way to the airfield that when the plane lands there, it will land "in the middle of the pioneering spirit." Piccard's co-pilot Andre Borschberg, who flew the leg from Japan to Hawaii, told Piccard he greatly admires his dedication and strength. He said the plane "represents what we could do on the ground in our communities, in our cities." The team was delayed in Asia, as well. When first attempting to fly from Nanjing, China, to Hawaii, the crew had to end their trip early and divert to Japan because of unfavorable weather and a damaged wing. A month later, when the weather conditions were right, the plane departed from an airport in Nagoya in central Japan for Hawaii. That trans-Pacific leg was the riskiest part of the plane's global travels, as there was nowhere for it to land in an emergency. The same is true for the trip from Hawaii to the U.S. mainland. The plane's ideal flight speed is about 28 mph, though that can double during the day when the sun's rays are strongest. The carbon-fiber aircraft weighs more than 5,000 pounds, or about as much as a minivan or midsize truck. The wings of Solar Impulse 2, which stretch wider than those of a Boeing 747, are equipped with 17,000 solar cells that power propellers and charge batteries. The plane runs on stored energy at night.